I've often felt that project management software wasn't designed with design teams in mind. In most scenarios, the dominant applications were focused on engineers or project managers. I decided to build project management software specifically solving the problems that design teams face. By focusing on design teams, a number of important differentiating features revealed themselves, namely: design systems, design feedback, and design processes. I fine-tuned these features through constant iterative improvement through coded design prototypes. Trino is the first time I've built a product myself. 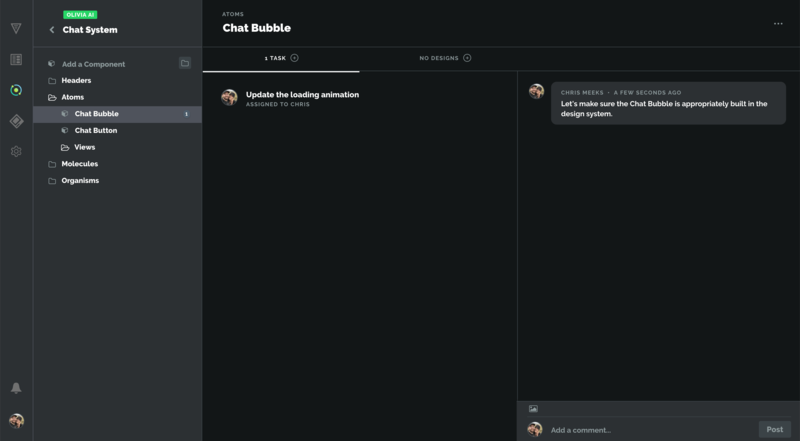 I learned the Bubble platform to bridge the gap between my front-end knowledge and all of the knowledge necessary to build a fully-functional SaaS app. Trino is doing well and attracting new users every day. It's free for a single user, so give it a try! The marketing site, which focuses on Trino's namesake (neutrino, which is a neutral subatomic particle). The view of a single project in Trino. The central components are: Tasks, Users, Designs, and Comments. The Task detail screen. 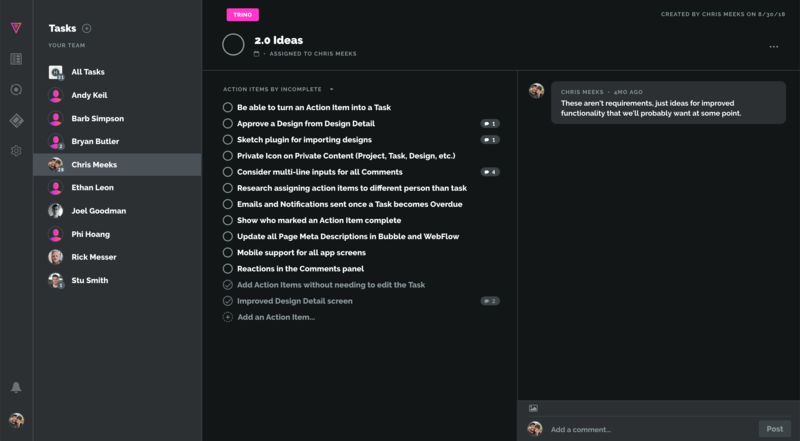 Tasks can have rearrangeable action items, comments, and designs attached to them. 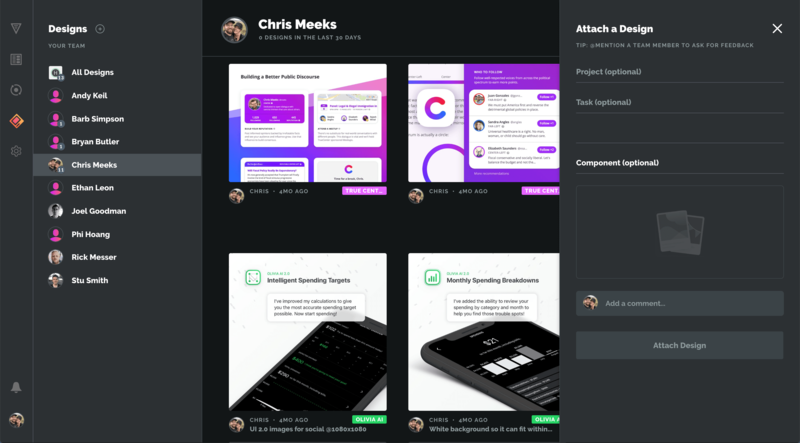 A team member's design feed. 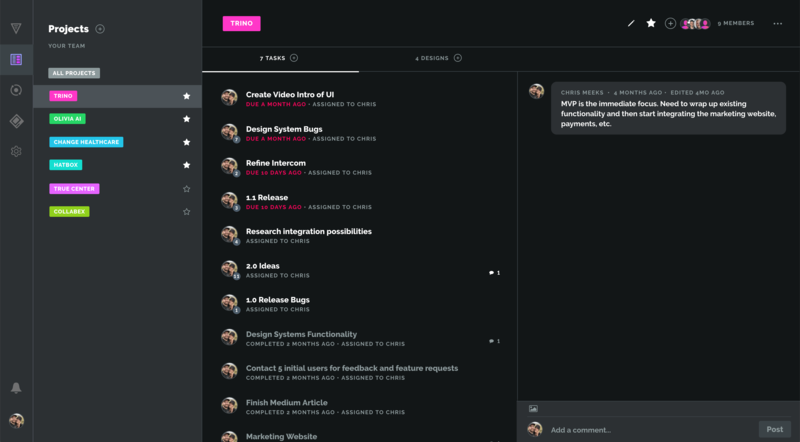 Each user's design work would be separately viewable (similar to Dribbble), so the whole team could view their work. An Atom, as represented within a design system. As part of my own work, I've often wanted to track individual tasks on design system components. So I developed a way to do that in Trino. You can sign up for Trino right now and see if it's helpful for you or your design team. I continue to improve the features as I have time and am looking forward to seeing how it evolves. As more design teams contribute their feedback, I'll be able to focus on features that deliver the most value.